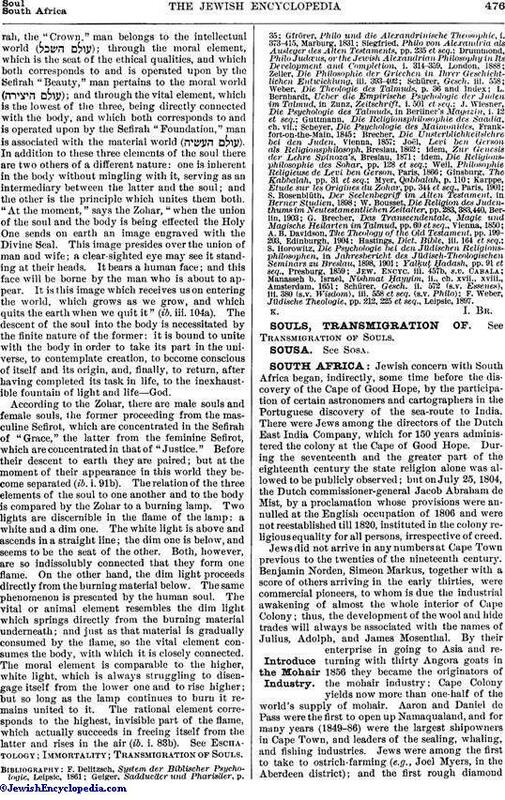 Jewish concern with South Africa began, indirectly, some time before the discovery of the Cape of Good Hope, by the participation of certain astronomers and cartographers in the Portuguese discovery of the sea-route to lndia. There were Jews among the directors of the Dutch East India Company, which for 150 years administered the colony at the Cape of Good Hope. During the seventeenth and the greater part of the eighteenth century the state religion alone was allowed to be publicly observed; but on July 25, 1804, the Dutch commissioner-general Jacob Abraham de Mist, by a proclamation whose provisions were annulled at the English occupation of 1806 and were not reestablished till 1820, instituted in the colony religious equality for all persons, irrespective of creed. Jews did not arrive in any numbers at Cape Town previous to the twenties of the nineteenth century. Benjamin Norden, Simeon Markus, together with a score of others arriving in the early thirties, were commercial pioneers, to whom is due the industrial awakening of almost the whole interior of Cape Colony; thus, the development of the wool and hide trades will always be associated with the names of Julius, Adolph, and James Mosenthal. By their enterprise in going to Asia and returning with thirty Angora goats in 1856 they became the originators of the mohair industry; Cape Colony yields now more than one-half of the world's supply of mohair. Aaron and Daniel de Pass were the first to open up Namaqualand, and for many years (1849-86) were the largest shipowners in Cape Town, and leaders of the sealing, whaling, and fishing industries. Jews were among the first to take to ostrich-farming (e.g., Joel Myers, in the Aberdeen district); and the first rough diamonddiscovered on the Kimberley Diamond Fields was bought by Lilienfeld of Hopetown. Jews are among the directors of the De Beers Consolidated Diamond Mines, which controls a great part of the world's diamond output to-day. These pioneers did not, however, confine their activity to trade. Capt. Joshua Norden was shot at the head of his Mounted Burghers in the Kafir war of 1846; Lieut. Elias de Pass fought in the Kafir war of 1849. Julius Mosenthal (1818-80), brother of the poet S. Mosenthal of Vienna, was a member of the Cape Parliament in the fifties. Simeon Jacobs, C.M.G. (1832-83), who was judge in the Supreme Court of the Cape of Good Hope, as the acting attorney-general of Cape Colony introduced and carried in 1872 the Cape Colony Responsible Government Bill and the Voluntary Bill (abolishing state aid to the Anglican Church), for both of which bills Saul Solomon, the member for Cape Town, had fought for decades. Saul Solomon (b. St. Helena May 25, 1817; d. Oct. 16, 1892), the leader of the Liberal party, has been called the "Cape Disraeli." He several times declined the premiership and was invited into the first responsible ministry, formed by Sir John Molteno. Like Disraeli, too, he early left the ranks of Judaism, but always remained a lover of his people. He went to Cape Town when a lad, where, with his brother Henry, he started a printing-office and, later, founded and edited the "Cape Argus." Descendants of these two brothers, Justice Solomon, Sir Richard Solomon (attorney-general of the Transvaal), and E. P. Solomon, are to-day among the most eminent men in South Africa. The few other St. Helena Jews who settled there during Napoleon's banishment, the Gideon, the Moss, and the Isaacs families, were all related to the Solomons, and, like the members of the last-named family, most of them drifted from Judaism. The first congregation in South Africa was founded in Cape Town in Nov., 1841, and the initial service was held in the house of Benjamin Norden, at the corner of Weltevreden and Hof streets. Later a room was hired at the corner of Bouquet and St. John streets, S. Rudolph, a German merchant, conducting the services. He was succeeded by a minister of the name of Pulver, who soon left for Australia. 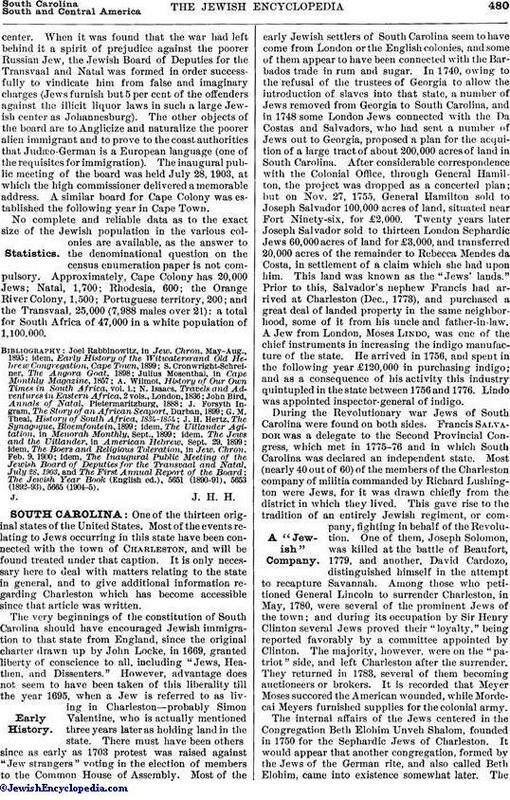 In 1859 the congregation, consisting then of about fifteen families, extended a call to Joel Rabbinowitz (1829-1902), who for twenty-three years worked indefatigably for his congregation, and for the scattered Jewish families in the coast towns and the interior of Cape Colony and the Orange Free State. Through his efforts the first synagogue in South Africa was erected in "The Gardens," in 1862. His successor was A. P. Ornstein (1836-1896) of Melbourne. In 1895 A. P. Bender (b. 1863; M.A. Cambridge) became the minister of the congregation. Bender, as did Rabbinowitz, takes a leading part in every humanitarian endeavor in Cape Town. 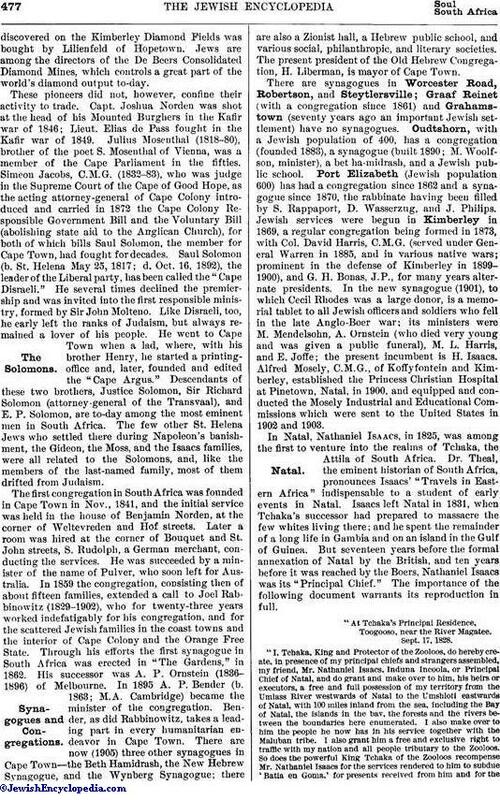 There are now (1905) three other synagogues in Cape Town—the Beth Hamidrash, the New Hebrew Synagogue, and the Wynberg Synagogue; there are also a Zionist hall, a Hebrew public school, and various social, philanthropic, and literary societies. The present president of the Old Hebrew Congregation, H. Liberman, is mayor of Cape Town. There are synagogues in Worcester Road, Robertson, and Steytlersville; Graaf Reinet (with a congregation since 1861) and Grahamstown (seventy years ago an important Jewish settlement) have no synagogues. Oudtshorn, with a Jewish population of 400, has a congregation (founded 1883), a synagogue (built 1890; M. Woolfson, minister), a bet ha-midrash, and a Jewish public school. Port Elizabeth (Jewish population 600) has had a congregation since 1862 and a synagogue since 1870, the rabbinate having been filled by S. Rappaport, D. Wasserzug, and J. Philips. Jewish services were begun in Kimberley in 1869, a regular congregation being formed in 1873, with Col. David Harris, C.M.G. (served under General Warren in 1885, and in various native wars; prominent in the defense of Kimberley in 1899-1900), and G. H. Bonas, J.P., for many years alternate presidents. In the new synagogue (1901), to which Cecil Rhodes was a large donor, is a memorial tablet to all Jewish officers and soldiers who fell in the late Anglo-Boer war; its ministers were M. Mendelsohn, A. Ornstein (who died very young and was given a public funeral), M. L. Harris, and E. Joffe; the present incumbent is H. Isaacs. Alfred Mosely, C.M.G., of Koffyfontein and Kimberley, established the Princess Christian Hospital at Pinetown, Natal, in 1900, and equipped and conducted the Mosely Industrial and Educational Commissions which were sent to the United States in 1902 and 1903. In Natal, Nathaniel Isaacs, in 1825, was among the first to venture into the realms of Tchaka, the Attila of South Africa. Dr. Theal, the eminent historian of South Africa, pronounces Isaacs' "Travels in Eastern Africa" indispensable to a student of early events in Natal. Isaacs left Natal in 1831, when Tchaka's successor had prepared to massacre the few whites living there; and he spent the remainder of a long life in Gambia and on an island in the Gulf of Guinea. But seventeen years before the formal annexation of Natal by the British, and ten years before it was reached by the Boers, Nathaniel Isaacs was its "Principal Chief." The importance of the following document warrants its reproduction in full. "At Tchaka's Principal Residence, Toogooso, near the River Magatee. Sept. 17, 1828. 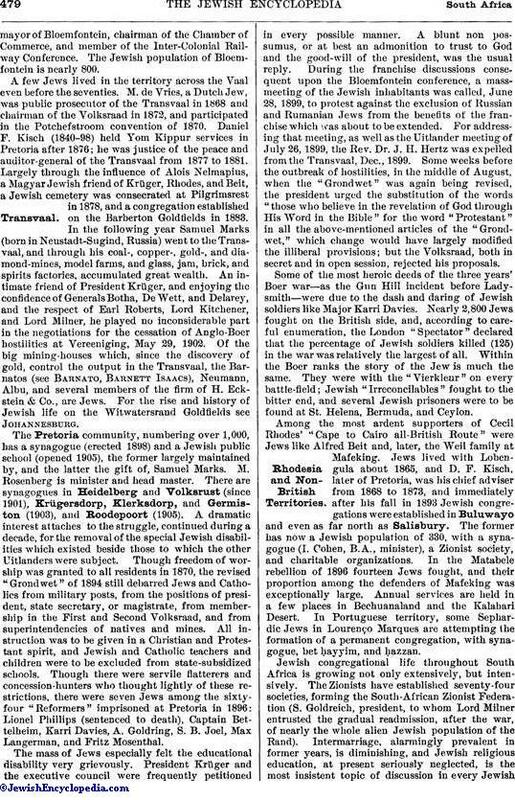 Later Jewish events in Natal merely reproduce, on a smaller scale, those in Cape Colony. Daniel de Pass was among the first sugar-planters in Natal, and Jonas Bergthal (1820-1902) took his seat in the Natal legislative assembly years before Jews were admitted to Parliament in England. In the nineties A. Fass was member of Parliament and M. G. Levy mayor of Maritzburg. Congregational life began at the time of the Zulu war. Services were held in Maritzburg, J. Kram ministering to the religious requirements of the few Jews in the entire colony. Services were held in Durban in 1874, a cemetery was laid out in 1878, and a synagogue was dedicated on Jan. 1, 1884. The ministers have been Feinstock, J. Kram, and the present incumbents, A. Levy and S. Pincus. The Durban Jewish population, which before the late Anglo-Boer war was only about 200, now numbers 1,250; a new synagogue was dedicated there in June, 1904. Durban has a Zionist hall and various subsidiary communal organizations. Through the annexation of the Vryheid district to Natal in 1902, that colony has at Vryheid a second synagogue, which was dedicated in April, 1904. Jews settled in what was formerly the Orange River Sovereignty, when its white population did not exceed 4,000. Isaac Baumann, born in 1813, arrived at Graaf Reinet in 1837 and moved to Bloemfontein in 1847. He and Martin Pincus were for a long time the principal merchants in the Orange Free State. For forty years after the establishment of the Orange Free State in 1855, one or two German Jewish families, many of them from Hesse-Cassel, were to be found in nearly every hamlet, together controlling the larger portion of the trade of the Free State. An annual Yom Kippur service was instituted in Isaac Baumann's house in 1871, in which year the first Jewish funeral occurred. The Bloemfontein congregation was established in 1887; a beautiful synagogue was consecrated in March, 1904, in the presence of the lieutenant-governor; the executive council, and the justices of the colony. Synagogue of the Witwatersrand Old Hebrew Congregation, Johannesburg; Oldest Synagogue in the Transvaal. Despite their small number Jews have from the first occupied an enviable position in the Orange Free State. Isaac Baumann was twice mayor of Bloemfontein and also director of the national bank. M. Leviseur, a veteran of the Basuto war (1864-66), has been connected with the State Museum, the Volkshospital, and nearly all other-state institutions since their respective foundations; and W. Ehrlich, the president of the congregation, is also deputy-mayor of Bloemfontein, chairman of the Chamber of Commerce, and member of the Inter-Colonial Railway Conference. The Jewish population of Bloemfontein is nearly 800. A few Jews lived in the territory across the Vaal even before the seventies. M. de Vries, a Dutch Jew, was public prosecutor of the Transvaal in 1868 and chairman of the Volksraad in 1872, and participated in the Potchefstroom convention of 1870. Daniel F. Kisch (1840-98) held Yom Kippur services in Pretoria after 1876; he was justice of the peace and auditor-general of the Transvaal from 1877 to 1881. Largely through the influence of Alois Nelmapius, a Magyar Jewish friend of Krüger, Rhodes, and Beit, a Jewish cemetery was consecrated at Pilgrimsrest in 1878, and a congregation established on the Barberton Goldfields in 1883. In the following year Samuel Marks (born in Neustadt-Sugind, Russia) went to the Transvaal, and through his coal-, copper-, gold-, and diamond-mines, model farms, and glass, jam, brick, and spirits factories, accumulated great wealth. An intimate friend of President Krüger, and enjoying the confidence of Generals Botha, De Wett, and Delarey, and the respect of Earl Roberts, Lord Kitchener, and Lord Milner, he played no inconsiderable part in the negotiations for the cessation of Anglo-Boer hostilities at Vereeniging, May 29, 1902. Of the big mining-houses which, since the discovery of gold, control the output in the Transvaal, the Barnatos (see Barnato, Barnett Isaacs), Neumann, Albu, and several members of the firm of H. Eckstein & Co., are Jews. For the rise and history of Jewish life on the Witwatersrand Goldfields see Johannesburg. The Pretoria community, numbering over 1,000, has a synagogue (erected 1898) and a Jewish public school (opened 1905), the former largely maintained by, and the latter the gift of, Samuel Marks. M. Rosenberg is minister and head master. 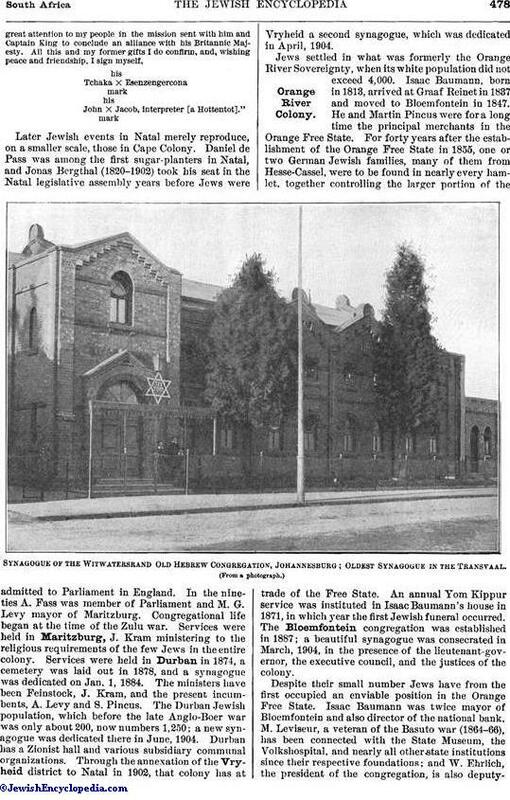 There are synagogues in Heidelberg and Volksrust (since 1901), Krügersdorp, Klerksdorp, and Germiston (1903), and Roodepoort (1905). A dramatic interest attaches to the struggle, continued during a decade, for the removal of the special Jewish disabilities which existed beside those to which the other Uitlanders were subject. Though freedom of worship was granted to all residents in 1870, the revised "Grondwet" of 1894 still debarred Jews and Catholics from military posts, from the positions of president, state secretary, or magistrate, from membership in the First and Second Volksraad, and from superintendencies of natives and mines. All instruction was to be given in a Christian and Protestant spirit, and Jewish and Catholic teachers and children were to be excluded from state-subsidized schools. Though there were servile flatterers and concession-hunters who thought lightly of these restrictions, there were seven Jews among the sixty-four "Reformers" imprisoned at Pretoria in 1896: Lionel Phillips (sentenced to death), Captain Bettelheim, Karri Davies, A. Goldring, S. B. Joel, Max Langerman, and Fritz Mosenthal. The mass of Jews especially felt the educational disability very grievously. President Krüger and the executive council were frequently petitioned in every possible manner. A blunt non possumus, or at best an admonition to trust to God and the good-will of the president, was the usual reply. During the franchise discussions consequent upon the Bloemfontein conference, a mass-meeting of the Jewish inhabitants was called, June 28, 1899, to protest against the exclusion of Russian and Rumanian Jews from the benefits of the franchise which was about to be extended. For addressing that meeting, as well as the Uitlander meeting of July 26, 1899, the Rev. Dr. J. H. Hertz was expelled from the Transvaal, Dec., 1899. Some weeks before the outbreak of hostilities, in the middle of August, when the "Grondwet" was again being revised, the president urged the substitution of the words "those who believe in the revelation of God through His Word in the Bible" for the word "Protestant" in all the above-mentioned articles of the "Grondwet," which change would have largely modified the illiberal provisions; but the Volksraad, both in secret and in open session, rejected his proposals. Some of the most heroic deeds of the three years' Boer war—as the Gun Hill incident before Lady-smith—were due to the dash and daring of Jewish soldiers like Major Karri Davies. Nearly 2,800 Jews fought on the British side, and, according to careful enumeration, the London "Spectator" declared that the percentage of Jewish soldiers killed (125) in the war was relatively the largest of all. Within the Boer ranks the story of the Jew is much the same. They were with the "Vierkleur" on every battle-field; Jewish "Irreconcilables" fought to the bitter end, and several Jewish prisoners were to be found at St. Helena, Bermuda, and Ceylon. Among the most ardent supporters of Cecil Rhodes' "Cape to Cairo all-British Route" were Jews like Alfred Beit and, later, the Weil family at Mafeking. Jews lived with Lobengula about 1865, and D. F. Kisch, later of Pretoria, was his chief adviser from 1868 to 1873, and immediately after his fall in 1893 Jewish congregations were established in Buluwayo and even as far north as Salisbury. 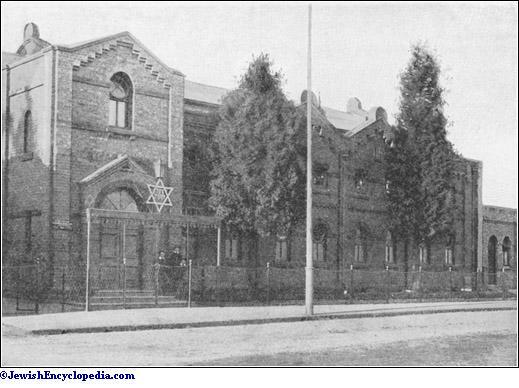 The former has now a Jewish population of 330, with a synagogue (I. Cohen, B.A., minister), a Zionist society, and charitable organizations. In the Matabele rebellion of 1896 fourteen Jews fought, and their proportion among the defenders of Mafeking was exceptionally large. Annual services are held in a few places in Bechuanaland and the Kalabari Desert. In Portuguese territory, some Sephardic Jews in Lourenço Marques are attempting the formation of a permanent congregation, with synagogue, bet ḥayyim, and ḣazzan. Jewish congregational life throughout South Africa is growing not only extensively, but intensively. The Zionists have established seventy-four societies, forming the South-African Zionist Federation (S. Goldreich, president, to whom Lord Milner entrusted the gradual readmission, after the war, of nearly the whole alien Jewish population of the Rand). Intermarriage, alarmingly prevalent in former years, is diminishing, and Jewish religious education, at present seriously neglected, is the most insistent topic of discussion in every Jewishcenter. When it was found that the war had left behind it a spirit of prejudice against the poorer Russian Jew, the Jewish Board of Deputies for the Transvaal and Natal was formed in order successfully to vindicate him from false and imaginary charges (Jews furnish but 5 per cent of the offenders against the illicit liquor laws in such a large Jewish center as Johannesburg). The other objects of the board are to Anglicize and naturalize the poorer alien immigrant and to prove to the coast authorities that Judæo-German is a European language (one of the requisites for immigration). The inaugural public meeting of the board was held July 28, 1903, at which the high commissioner delivered a memorable address. A similar board for Cape Colony was established the following year in Cape Town. No complete and reliable data as to the exact size of the Jewish population in the various colonies are available, as the answer to the denominational question on the census enumeration paper is not compulsory. Approximately, Cape Colony has 20,000 Jews; Natal, 1,700; Rhodesia, 600; the Orange River Colony, 1,500; Portuguese territory, 200; and the Transvaal, 25,000 (7,988 males over 21): a total for South Africa of 47,000 in a white population of 1,100,000. The Jewish Year Book (English ed. ), 5651 (1890-91), 5653 (1892-93), 5665 (1904-5).